CaliLand Engineering is a dynamic Civil Engineering and Land Surveying consulting firm in the greater Los Angeles County. We satisfy Federal, State & Local Government Agencies, Architects, Private Developers, Lenders and provide superior quality services efficiently and expeditiously at competitive prices. Our highly trained design engineers & technicians use the state of the art engineering computer software to solve complex engineering calculations. Our survey teams are trained with the most advanced field electronic survey equipment to collect valuable field information to meet the demanding & competitive market. Mr. Lai holds dual professional licenses issued by California State Board for Professional Engineers, Land Surveyors and Geologists. Mr. Lai is licensed as Professional Land Surveyor, PLS 8886; and also a Registered Civil Engineer, PE 60565. 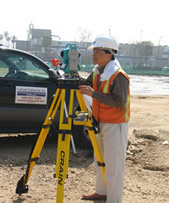 As Director of Civil Engineering and Land Surveying Departments, Mr. Lai leads a team of civil engineers & land surveyors for various residential and commercial land development projects within the greater Los Angeles County and 88 cities within said County. Mr. Lai and his team operate in the same office in Alhambra since 1999.